Review: When it comes to a movie titled "Headshot" you most likely think of a brutal revenge thriller of the 80s. And that's not really that far from the truth since this, to be exactly even ultra-brutal, action flick feels like a reiteration of well known genre flicks of past action cinema times, when you still could have a fun time without thinking too much of the several plot holes. "Headshot" provides the minimum of story and you can actually derive it from the title, if you simply assume that the two directors took a page out of the book of similar works. So is that a good or bad thing? It depends on what you want. With "Headshot" you certainly get what you would expect from a genre work of this kind and on a high level of quality at that. Counting among the positive aspects of the flick is without a doubt the cinematography. The pictures look stylish and the movie is top-notch in terms of quality which also should allow "Headshot" to be released in the West without a problem. This production is, concerning its cinematography, on par with "The Raid", which the flick naturally shares the lead actor Iko Uwais with. The sets are well chosen, dark and gritty. Especially in the first half the police station is memorable. Dirty walls, dimly lit sets, here you get some true gritty action cinema which is also reflected in the incredible brutality. In parts it is particularly the high level of violence which makes the movie stand out. Along with the fight choreography and the dark pictures this creates a level of intensity with which "Headshot" easily counterbalances its not really that inventive plot. So let's talk about the action. If this is what you are looking for you will get it. It's very rare for the movie to give you a breather and it's fascinating that the action doesn't get boring. This is also because we don't just get Ishmael's perspective in the beginning, but also Ailin's and Lee's. This creates some variation which sadly is nowhere to be found during the second half. Because then the little plot there is, and which holds things together, is falling by the wayside. As if taking part in a tournament Ishmael has to fight his way up to the boss in one-on-one clashes. That's in fact rather tiring, even though in order to bring something different to the table there is also a fight against Julie Estelle ("The Raid 2") at a sunny beach. The bunker during the showdown can't really be called inventive, though. 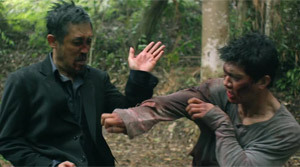 It's too obvious that directors Stamboel and Tjahjanto wanted to stick very closely to Gareth Evans' "The Raid"-series. Still, they are successful in that! The action is fantastic and has been choreographed by Uwais, resp. his team. The fights themselves do not consist of incredible techniques, but are of an extreme power, meaning that during each single combat we get the feeling that the protagonist is desperately fighting to survive, also thanks to a dynamic, although quite shaky, camera work. This is quite effective for getting the viewer on the edge of his seat. As already stated, the extreme amount of violence depicted by the villains, which more or less have been brought up as animals and don't know any different, is helping a lot to achieve this. Sunny Pang showcases great charisma as the gangster boss while the rest of the cast delivers decent portrayals as well for a movie of this kind. You can still tell that Uwais isn't an actor, but he is more confident in his role and movies like "Headshot" aren't rated based on acting chops. Actually, you have to give Stamboel and Tjahjanto credit for getting things straight and leave no doubt that they simply want to deliver violent, gritty action cinema, in which the story is negligible or not even present that much. Thus, the many plot holes aren't that much of a nuisance either. The movie is simply supposed to entertain and it does. The characters are at least not completely uninteresting. Despite the very hard and well done action the flick could have been a little bit shorter. Particularly during the second half the finale should have been trimmed down a bit since some stuff is just unnecessarily repititive. Qualitywise the movie can't keep up the suspense until the end and that's a shame because this could make you forget that the first half has in fact managed to put different locations and ideas together. In the end, you clearly have to recommend the movie to fans of the genre because of its violent-nihilistic nature, though.